ELBA means made in Italy. The Italian heritage is evident in every product, every feature and every detail. Our products have the precious value of a long tradition of design and manufacturing excellence which are peculiar and proper of our territory. A true Italian style culinary experience means simplicity of ingredients, passion for creativity, taste for quality with no compromise. The same simplicity and passion inspire our cooking appliances. 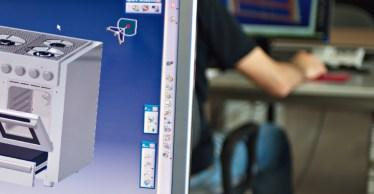 ELBA products constantly communicate the dedication to innovation. We aim to offer products that enhance the beauty of homes and lives, because your kitchen is a unique space and deserves the excellence of real benefits. The plant occupies a covered surface of 30.000 sq m., 75% of this area is assigned to the production facilities while the remaining portion is taken up by the stock of finished products, offices and laboratories. 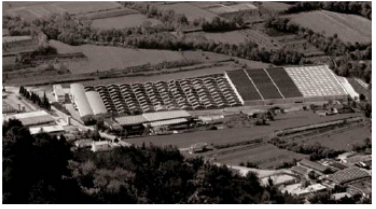 The present facilities allow an overall capacity of 500.000 units. The present work force consists of around 450 employees. Considerable resources are allocated in order to achieve the needed skill and to support the development of R&D which manages the most up-to-date systems and technical equipments, in accordance with the severe ISO 9001 norms. Our Gas Laboratory obtained the CE certification in the year 2000. It is authorized to perform officially recognised type tests. This acknowledgement is very important and prestigious, only a few manufacturers in the white goods industry have been granted. 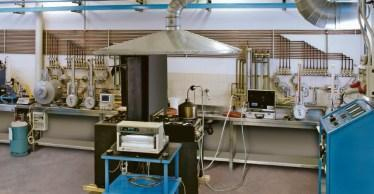 The equipment of the laboratory reflects the attention of the company towards a more difficult technical demand and is conformed to the highest standards. Among the most prestigious acknowledgements we proudly gained the Laboratory Authorisation by CERTIGAZ and Certification of Qualification by CSA International. In order to accomplish the different worldwide standards, the company achieved the most important certifications. Its close relations with institutions and organisations witness its commitment to fulfil technical standards required in each country. GOST (Russian market), AGA (Australasia markets), SASO (Arabian markets), PSB (Singapore), ISI (Israel), KTL, KGSC (Korea), CCC (China), IMQ, INTERTECK, UL, CSA (US/CANADA), AENOR (Spain), SEV, SVGW (Swiss). The process starts with the coiling of steel (different types) or stainless steel which is automatically cut to size on the shearing line. Then the different body parts are produced with the help of a large battery of special tooled mechanical presses. 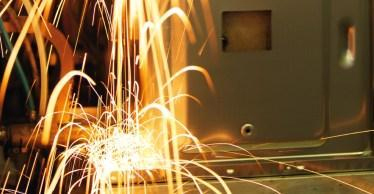 The structure of cookers and ovens is built up by a fully automated welding machine. This shop operates in two 8-hour shifts. ​All parts subject to a heat exposure over 100 °C are submitted to the enamelling process. This treatment consists of three steps. PICKLING PROCESS: where the pressed parts are degreased. ENAMEL APPLICATION: which can be done using different systems. 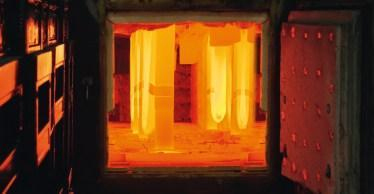 FIRING PROCESS: which is achieved at a temperature of 850 °C in a tunnel furnace. Thanks to the availability of two furnaces, it ensures the largest output (> 8,000 kg/hour). The remaining pressed parts are treated with a polyester paint coating resistant to 200 °C. Two painting lines are assigned to this process. As a rule, this department represents the core of a cooker factory and we are justifiably proud of our facilities. Pre-assembling operations like CNC gluing process and handmade serigraphy are worked out by specialized staff and equipment. This gives us more flexibility in production scheduling. The assembly bay occupies the largest portion of the production area (about 30%). Beside this area, a semi-automatic warehouse of incoming components provides the necessary materials for the pre-assembly bay or the assembly lines, according to the production schedule. 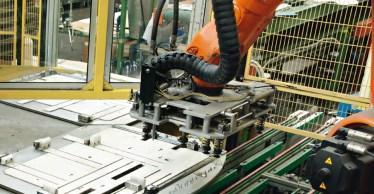 The assembly department is organized in such a way that every line is assigned to a specific type of appliance. There are 14 assembly lines, some of them are multipurpose in order to respond immediately to an increased demand for a particular item. This department operates on a single (8-hour) shift. All the stages of the manufacturing process are controlled by a system of procedures and a system of checks and records which ensure the required level of quality in all operations. 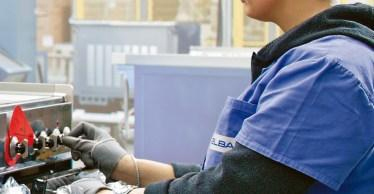 ELBA obtained the international certification to ISO 9001 Standard in September 1998. Our internal quality assurance system was previously certified to the “CE” mark Requirements from 1995 onwards. In November 2009, the quality assurance system was updated to comply with ISO 9001:2008.